When visiting a new town, one of the first things that you try and plan out a bit is what to do while you are there. For the most part, you have a rough idea of some of your top choices of activities. However, what have you planned to do in the evenings? You can’t stay in your room all night so we at Ledges Hotel suggest taking a break from reality and stepping into the world of Ritz Company Playhouse where you can visit other worlds and meet new people. Come see how the Ritz Company Playhouse has impacted the lives of us in Hawley for years and what they have in store for you for their 2015 season. The Ritz Company Playhouse has been putting on shows since 1973 and has been running for more than 40 seasons all with fantastically produced plays. The residents and visitors of Hawley have enjoyed every season. Over the years, generations of actors have been helping the Ritz Company Playhouse bring their productions to life. Because of this the Ritz Company Playhouse has been able to develop and promote a love for the arts here in Hawley. The first show at Ritz Company Playhouse is The 25th Annual Putnam County Spelling Bee and will run starting July 3rd and run the following 2 weekends for both matinee and evening shows. 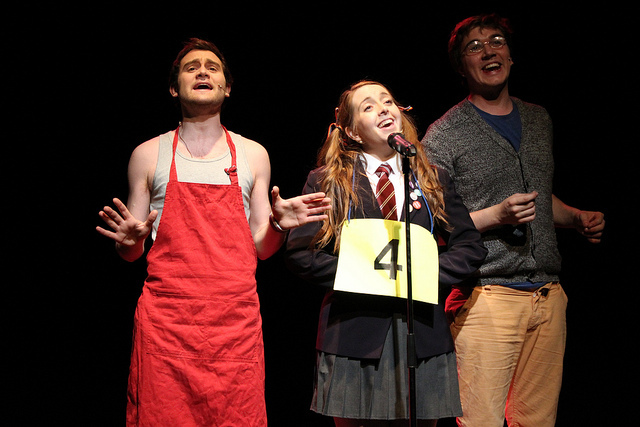 This musical centers around a fictional spelling bee in an average town. It features 6 interesting children and the spelling bee is run by 3 equally as interesting adults. Be prepared to see many emotions while the events of this spelling bee unfold. Up next at the Ritz Company Playhouse is A $lice of the Blarney which will start on July 24th and end the next weekend on August 1st. This play has evening and matinee shows as well. This dark comedy is the story of Shannon O’Leary, a man on his deathbed who while having a full bank account, doesn’t have a close family. As relatives learn that he is to die soon, they swoop in. Watch how his death unfolds as well as what happens with his family. The next play at the Ritz Company Playhouse is performed by their junior acting group and is most children’s favorite story, Cinderella. This version, G2K Cinderella, has been adapted for children and will have all of the same characters that they are used to as well as highlight some important lessons to be learned. This production will be performed August 7th and will end the following weekend. Arsenic and Old Lace is up next at Ritz Company Playhouse. This dark comedy is about Brewster family in New York. While they were decedents of those on the Mayflower, they now are “homicidal maniacs”. Enjoy a night of interesting family drama. This play will run August 21st and will run for the next 2 weekends. The last production for the 2015 season at Ritz Company Playhouse is $38,000 For a Friendly Face. This comedy takes place in a nursing home after the death of one of its residents and the familial ties that can either break or be strengthened after it. Come have a look at the funnier side of relationships. This production will run from September 18th and run that weekend and the next. As you can see, we in the Pocono Mountains do love and appreciate the arts, especially when there are fantastic plays put on by the Ritz Company Playhouse. When you do decide to come to the Pocono Mountains, we hope that you will come stay with us at Ledges Hotel. Our beautifully restored hotel is set against the natural beauty of the mountains as well as our nearby gorge. You will love the views from your modernly decorated room and will fall asleep instantly in our luxurious beds set with Comphy linens. Before you head out for an evening at the Ritz Company Playhouse, be sure to come and dine with us at our in-house restaurant, Glass. Contact us today and book a room with us for your next trip to the Pocono Mountains. Want to find out about more activities in the Pocono Mountains? Request your free Vacation Guide today!